Golf is a European sport. Didn’t it originate in Scotland ? However in spite of the humidity and heat, golf seems to be quite popular in Manila. It all started quite a long time ago – supposedly brought over by the British men who worked for the Manila Railway Company. 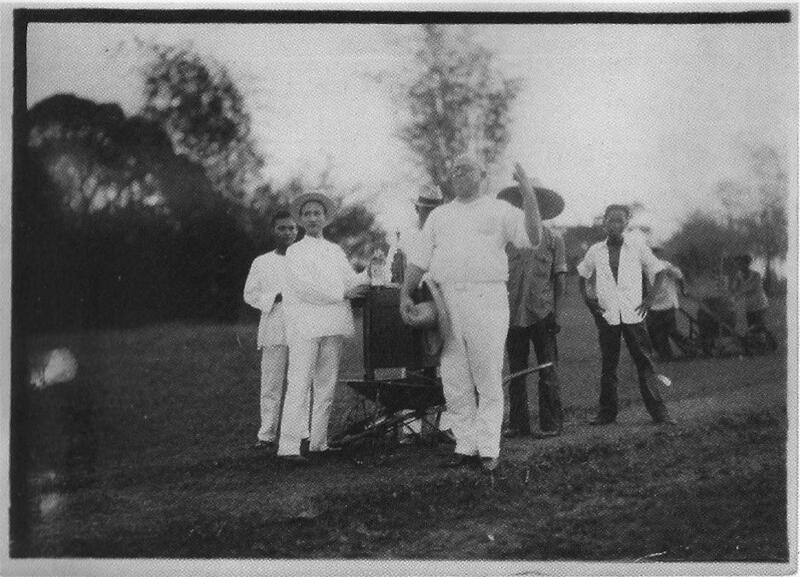 Apparently with ample time on their hands and a surplus of caddies available to haul one’s clubs and the occasional beer, the Brits built a 3-hole course somewhere in the paddy fields around Intramuros. The sport became popular enough that by 1901, a 9-hole course was built next to the railway station in Caloocan. 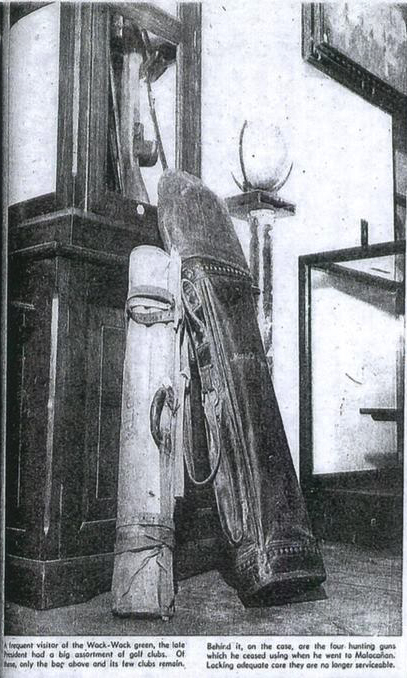 This was the start of the Manila Golf Club. It was no time at all before the competition begged for a tournament. 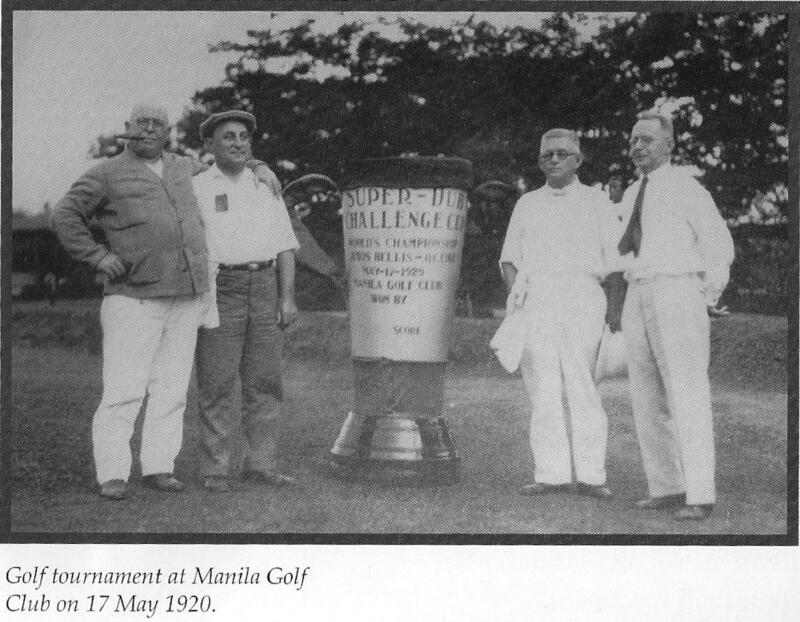 The Philippine Open was established in 1913, making it one of the oldest in the world. But there’s more to it than that of course, and hence the reason for my little story. 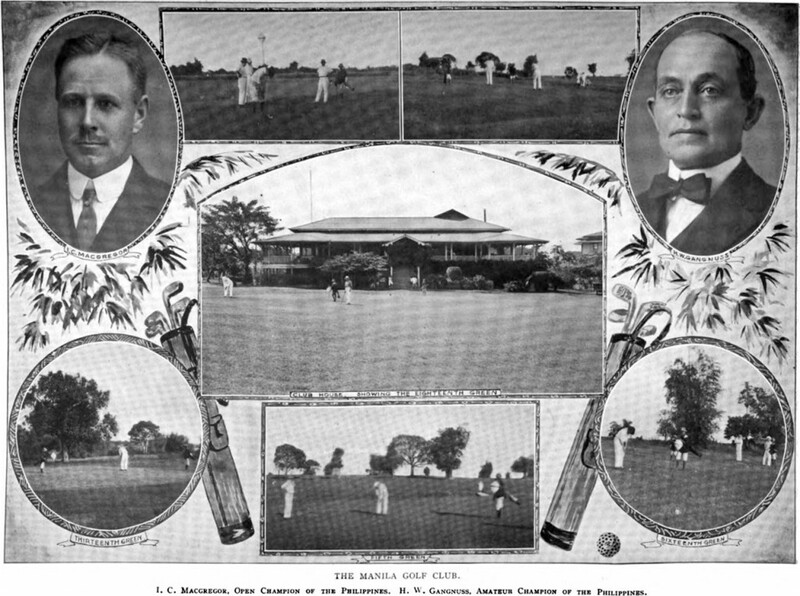 The Philippine Open was held from 1913 to 1934 at the Manila Golf Club, mostly won by Caucasian amateurs. Filipinos were barred from taking part in the Open until some kind-hearted unidentified American decided to sponsor a talented local caddy, Larry Montes, who learned the game by himself without the benefit of coaches and trainers or golf theory and training. Somehow he bypassed the color barrier and was allowed to play. The irony of it was that he won and became the club’s first professional champion. But the officials were agog because as winner of the open, he deserved to sit at the presidential table during the awards dinner. Alas, cooler (and bigoted) Caucasian heads prevailed and they asked poor Montes to leave in the middle of the ceremony, stating club rules which prohibited caddies from entering the clubhouse. Enter William “Bill” Shaw, an American member of the club and coincidentally married to a Filipina. The club officials soon felt his anger at this blatant evidence of discrimination. Shaw was no pushover. He arrived in Manila in 1901 on board a United States Army transport ship. He started out as a timekeeper at a stone quarry owned by the San Francisco Bridge Company in Mariveles. From “Bill Shaw: the Man and the Legend” by Lewis Gleeck, Jr. Always known for his hard work ethic and the art of persuasion, initiative and foresight, Shaw and his friends eventually took over AG&P (Atlantic Gulf and Pacific) see above. The company was involved in engineering, manufacturing and steel fabrication. 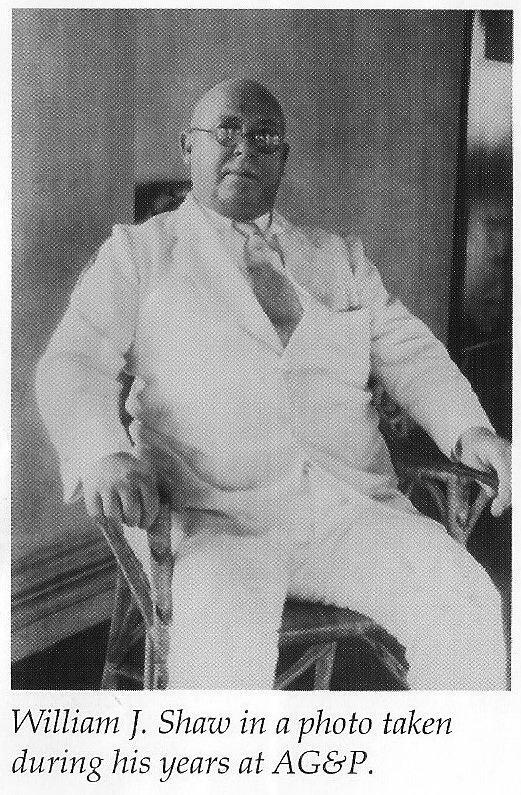 Shaw adopted the Philippines as his country, never leaving to return to the U.S. even for a brief visit. Membership subscriptions were offered at P1,000 each among Filipinos and foreigners with a limit of 400 active members. The subscription was quickly filled. The club was incorporated in February 28, 1930 with Bill Shaw as its first president. Wack Wack East course in 1945. Bill Shaw contracted the services of Jim Black, a golf professional from the United States, to direct the construction of the course. (Black was also hired to redesign the Manila Golf Club in 1948.) The construction of the first 18 holes was started in April 1931. After the construction of the first 18-hole course, known as the East Course, Bill Shaw bought a parcel of land adjoining the Wack Wack property, on which another 18 holes were constructed, known as the West Course. Odd name for a club, Wack Wack. Apparently it started when a foursome was playing at Archbishop O’Doherty’s 9-hole course rented to Shaw and friends. At the last tee near Malecon Drive close to Ft. Santiago, when one golfer hooked his drive into some tall bushes, scaring the heck out of some crows. Their cries sounded like “wak wak” . From then on the term wack wack was yelled out similar to the term “fore”. The club’s logo shows the two wacks or crows. True ? Some say, it was termed for the Tagalog reference to the raven, Uwak Uwak. But Bill Shaw loved his club, it was his passion. He had his usual table by the window overlooking the first tee. The beautiful clubhouse was to become quite a popular rendezvous for dancing and receptions. What made it even more successful was the fact that the club welcomed everyone. He was incredibly devoted to the success of the Club, even becoming a daily fixture at the entrance door leading to Tee No. 1. He would greet all the golfers that passed by, and later on make rounds at the Club to ensure the members were having a good time. 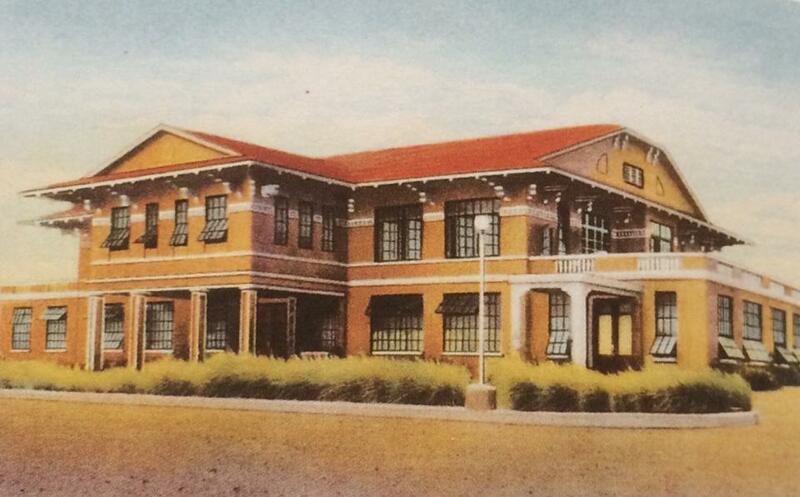 The attractive Wack Wack clubhouse, a showcase of pre-war Manila, was destroyed by fire. Another second structure, even more luxurious, was again badly damaged by a fire and unfortunately destroyed all the club’s historical records and pictures. 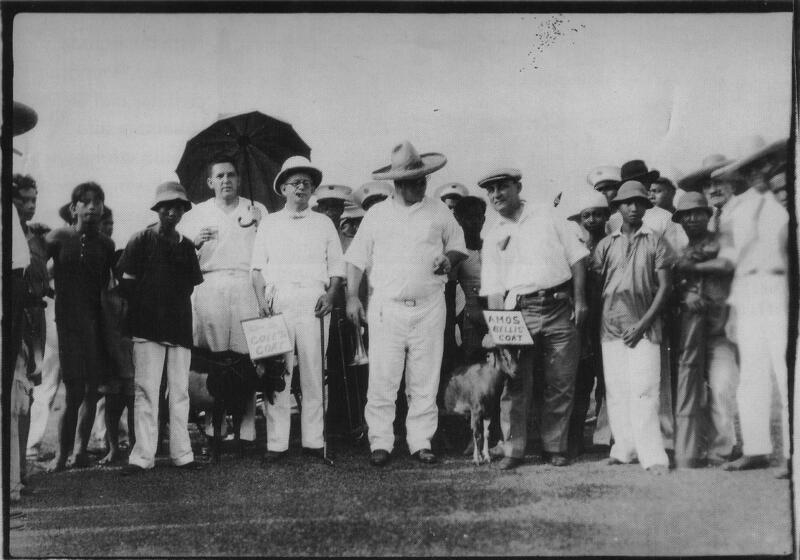 Fun loving Bill Shaw and mascot “Bellis” goat named for Amos Bellis of Heilbronn Inc.
Shaw was known for his love of the Filipino people and often made charitable donations. A tribute in the Manila Bulletin extolled that “when one project for community progress faced crisis, he was the one to meet the crisis –with money and with organization and directing effort. He was particularly interested in the underprivileged, and made his interest count to give them better privileges”. In fact, each year he hosted an annual Christmas party for the poor children of Tondo and Meisic districts. Shaw did permit himself one indulgence. He ate ravenously. Most observers and associates were content to describe his food consumption as prodigious, and nearly all of the most frequently repeated stories involve the theme of a gargantuan appetite. From a relatively slim young man, he ballooned to 300 lbs. Apart from overeating and smoking cigars, Shaw never touched alcohol and he never joined the characteristically inebriated parties that his American contemporaries were so fond of. Quite a magnanimous man, Bill was also a devoted father to his adopted son Joe. He would pick him up daily at La Salle school. It was rumored that Bill was Joe’s natural father and married to Joe’s Filipina mother. As an adult, Joe was provided many offers of employment by Shaw’s AG&P company but declined to follow his father’s footsteps, which may have indicated problems with his treatment at home. 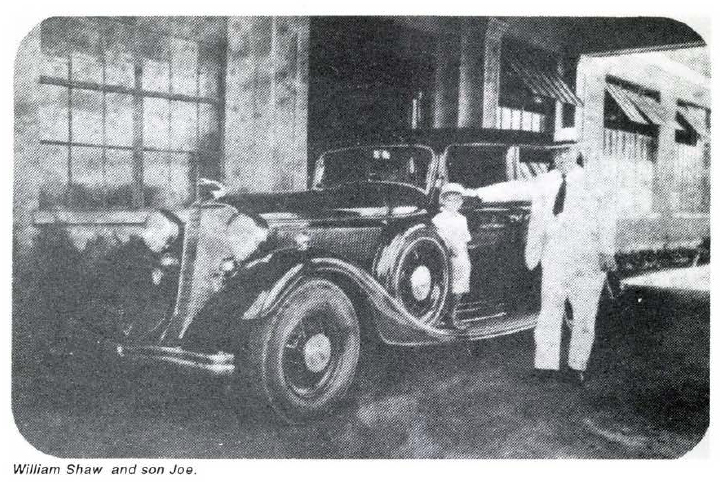 The above photo with son Joe, was taken at the front entrance of the old Wack Wack building (source: Jim Litton). William J. Shaw died on March 1, 1939 at his Caloocan home of a malignant throat ailment. 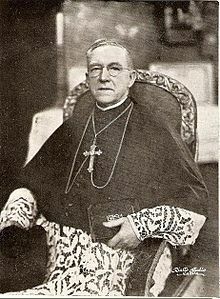 His funeral at the Cemeterio del Norte on March 4, 1939 was well attended by his many friends and colleagues. 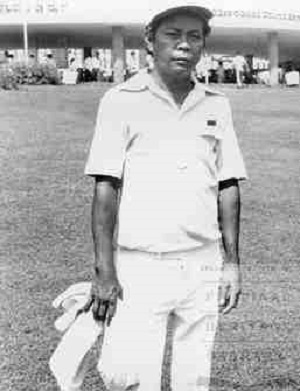 Before his death, he donated 27 hectares of land for an additional 9 holes to be added to the golf course. His devotion to the game and the Wack Wack club remains his legacy which is honored by a memorial park within the property. A bronze bust monument to Shaw can be seen as one approaches the entrance from Shaw Boulevard. After Manila was liberated, one of the favorite spots for military R&R was the clubhouse, pool and golf course at Wack Wack. Golf wasn’t just a man’s game. Today, Wack Wack Golf & Country Club continues to be a world-class golf club, considered as one of the top 100 courses in the world. The 7000 yard, par 72 East course is a championship course where the 1977 World Cup was played. The West course is a resort course. 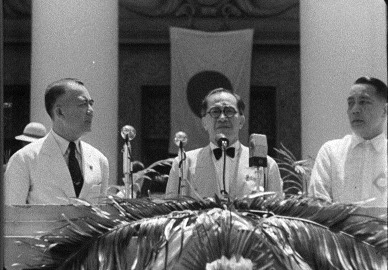 On June 5, 1943, as president of the Philippine provisional government under the Japanese, Jose P. Laurel was playing golf at tee #7 when he was shot around 4 times. The bullets barely missed his heart and liver. He was rushed by his golfing companions, among them FEU president Nicanor Reyes, Sr. to the Philippine General Hospital where he was operated by the Chief Military Surgeon of the Japanese Military Administration and Filipino surgeons. Laurel enjoyed a speedy recovery. During the later stages of the war circa 1944-1945 Japanese aircraft were dispersed into the golf course area to hide them from aerial observation and Allied bombing attacks. Part of a grim reminder of history, Sadaaki Konishi, the cruel commander of the Los Baños Internment Camp escaped when the camp was liberated in February 1945. 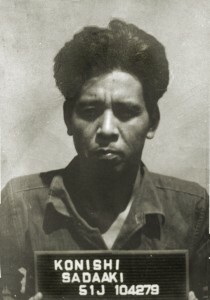 He was eventually captured and assigned to a group of POWs to clean up rubble around Manila. As luck would have it, he was recognized by one of the Los Baños internees at the Wack Wack Golf Club in Manila in July 1945. Konishi was tried as a Class C war criminal for the offenses of violating the laws of war. He fully admitted to the massacre of thousands of civilians and added that “he had been conducting a war and left such mere details to his staff.” He was hanged in Sugamo Prison April 30, 1949. A Maryknoll nun, Sister Theresa, later reported that shortly before his death, Konishi became a convert to Christianity. The above photo is of Gen. Hilario Moncado at the Wack Wack. Quite the celebrity, Moncado was an ace golfer who challenged Pres. Manuel L. Quezon during the November 11, 1941 elections. Out of 3.5 million votes, he lost by only 10,000. He was Commander in Chief of Philippine Guerrillas during three years Japanese occupation in the Philippines. He was tortured at Fort Santiago, but he escaped and founded the Crusaders Army by successfully recruiting 2.5 million volunteer guerillas all over the country. This paved the way for the smooth return of Gen. MacArthur by mobilizing his guerrillas from the Crusaders Army, in addition to helping liberate the internees at Santo Tomas Internment Camp. He later retired to Tijuana, Mexico and died there under mysterious circumstances in 1956. I remember my father and uncle used to belong to Wack Wack. Dad workedfor AG&P at one time. Congratulations again Lou for another outstanding blog. For decades, 50s through the early 50s, I was almost always motoring, driving, walking, etc along Shaw Blvd. I was never far from Shaw Blvd and Wack Wack GC. I lived in Sta. Mesa (behind Lourdes Hospital) just before the bridge before Mandaluyong. I lived in San Juan about 3 or 4 blocks away from Shaw Blvd (Luna Mencias near P.Guevarra). I had this notion all the while that Wack Wack was given that name because of the golfer’s motion and the sound he creates when the golf club makes contact with the ball…..whack! Thanks for another history lesson and the photos to go with it. It is good to have a major street named after Bill Shaw. After reading more about him, the golf club should have been named after him as well. Fond regards. Corrections: I meant outstanding “article” and “50s through the early 80s” Thank you. Another interesting & well written article on Wack Wack, Lou. We were members of Manila Golf, but it seems that Wack Wack has a more interesting history. Ben Arda gave me my first lessons on golf back in 1966….He was very quiet humble & unassuming. The next year, I left for college in the states. I look forward to more interesting articles ! Goodness, I remember going by there everyday on the way to Hwy 54 and school. I would guess that my brother, Horst, went there all the time but I never did. From the today picture I do not think I would ever be able to find my way these day. Great article. Thanks for you continued articles of old Manila. Great coverage Lou….I was there at the 1961 Philippine Open! This is enlightening! Ferdie Shaw, a grandson of Bill Shaw is a childhood friend and told me how they (Shaw family) are being neglected by current Wack Wack Golf administrators..
Again, an outstanding look back at a Manila institution. Excellent! I’ve heard the story that the sadistic second-in-command Japanese officer at Los Banos, Sadaaki Konishi, was found working as a laborer at the Wack Wack Country Club after liberation and was subsequently arrested. Konishi was the individual who let the Los Banos internees almost starve to death in the last weeks and months in the camp. He was executed, by hanging, in Sugamo Prison on April 30, 1949. Thanks for reminding me Ted. I have updated this article to include that bit of grim trivia. Another outstanding blog! We appreciate all the time you devote to researching the history of Manila. You’ve taught us all so much about the city we grew up in and love so much! P. S. Gisela, you’re right, you would not be able to find your way around today. I’ve been back four times in the past five years, and everything is so different! You can’t even see the water from what used to be Manila Bay! It’s a shame more thought wasn’t put into the inevitable growth of Manila. No mention of Celestino Tugot. Perhaps he was not associated with Wak Wak. BTW. Sir Lou Gopal is in the hospital as informed by the Manila Nostalgia FB group. I am not aware of the details. Please pray for his speediest recovery. thank you for the brief history of wack wack golf club lou, i just wish they didnt change the main clubhouse in the 1990’s. best wishes and get well soon lou. Lou, thanks so much for the post on Wak Wak. I do have a question for you or any of the readers. Would you happen to remember, or would you happen to have heard of, an 18-hole golf course in Caloocan, in operation just before WWII started, located in the area around University Ave.? I believe it, too, was run by the British. There’s some confusion among my family as to the name of that course. We think it might’ve been called Buwaia (not sure about spelling) Thank you to you or anyone who can supply the answer. 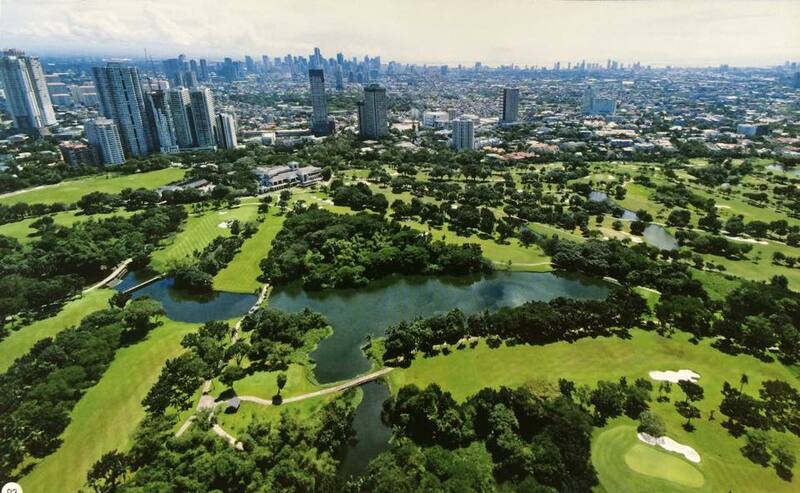 Celeste – I believe that might have been the original site of the Manila Golf Club, originally started by the British in 1903 ? Thank you for this post. Larry Montes was my lolo, and so I occasionally google his name. It’s always a little thrill when something new pops up! My Great Uncle Jimmy Black built this golf course !! My Grand Mother Marry Black, Jimmy’s sister. I need to play Wack Wack someday !! Lou, I don’t think we know each other but I have been enjoying your blog from afar. I was a student at the AS from 1946-1953 (Grades 1-8). My father arrived in Manila in 1929 and worked with L.R. Nielsen from 1935-41. I think my father appears in the photo you included in the Wack-Wack blog depicting a Nielsen farewell party. I’d be interested in knowing the date (and source or custodian) of the photo, as it may also include my mother. Almost all of my parents’ pre-war photos taken in the P.I. were lost during the war, so discovering this one feels like an archeologist’s “Eureka” moment. Best regards. BTW, I was known as “Derich” while in Manila. Outstanding post, very instructive. I have played 4-5 times at Wack Wack and its outstanding fairway and facilities is something to be proud of. Indeed it can be ranked among the world’s best 100 clubs. Thank you. The photo of the late Bill Shaw with his son Joe on the stepping board of that black limousine was taken right in front of the front entrance of the old Wack Wack building. Before the war, my family used to go to Wack Wack every Sunday. While my folks would play golf, I would spend most of the day at the swimming pool. I was very familiar with the club building and I am certain that the subject photo was taken at the front entrance of the club. Thanks for the correction Jim. I’ve edited the article accordingly. Wack wack Golf country club sure has its fair share of history and having the chance to live nearby it would be somewhat of a dream. Hi sir, I am the great grandson of the great mr. Shaw. I am always keen on reading stories and perspective about him through other sources apart from my grandmother. Thanks for writing this. I truly enjoy reading your blog of nostalgic Manila . My heart aches every time I look at the lovely pre-war photos. What a beautiful country ! Do you have any history on Estrella del Norte Department store owned by the Hermanos Family? I believe it had stores in Iloilo and Escolta.